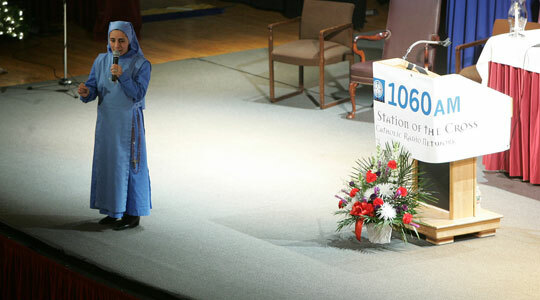 On Saturday, December 10, 2011, WQOM and The Stations of the Cross hosted a one-day Advent conference for listeners in celebration of the one-year anniversary of WQOM in the greater New England area. The conference was entitled “Prepare the Way,” and was held at the Lowell Memorial Auditorium. It featured notable Catholic speakers such as Fr. Mitch Pacwa, Brian Patrick, Dr. Ray Guarendi, and Sr. Olga Yaqob. Cardinal Seán O’Malley was the Mass celebrant and The Good Catholic Life’s own Scot Landry was the emcee for the day. The day started with a Rosary at 9:30am and then the first talk by Brian Patrick, host of the Son Rise Morning Show. Then we heard from Sister Olga Yaqob of the Daughters of Mary of Nazareth community of women religious. After lunch, Fr. Mitch Pacwa, S.J., who you’ve seen on many EWTN TV shows gave a rousing talk. And the last scheduled speaker was Dr. Ray Guarendi, host of The Doctor Is In, who left the audience in stitches with his hilarious advice on parenting. After the Archdiocesan Boys Choir, from the Choir School at St. Paul Parish in Cambridge, performed, the day ended with Mass celebrated by Cardinal Seán, who gave an inspiring homily. Finally, we were pleased to give away a specially engraved iPod touch to one lucky conference participant, Sheila Tripodi. Do you think she was destined to win because of her last name? Thank you to our friends at WQOM and the Stations of the Cross, as well as all the listeners we came up to tell us how much they enjoy the show. We appreciate your feedback on our first 200 shows and look forward to serving you for many more.